The Series 682 Industrial Pressure Transmitter is designed to withstand environmental effects such as shock, vibration, temperature, and EMI/RFI. The electronics and capacitive sensor are packaged in a welded stainless steel housing and meets NEMA 4 (IP65) protection ratings. 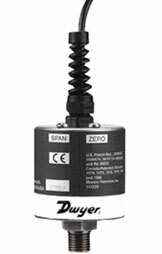 The transmitter features external zero and span adjustments and reverse polarity protection. The Series 682 delivers high performance in tough applications such as off road equipment, hydraulic systems, compressor control, industrial engines, or industrial refrigeration. Wetted Parts: 17-4 PH Stainless Steel. Accuracy: ±.13% FS (includes non-linearity, hysteresis and non-repeatability). Pressure Limit: See chart on "Ordering" page. Thermal Effect: Zero shift: 1.0% FS/100°F (% FS/50°C); span shift: ±1.5% FS/100°F (% FS/50°C). Electrical Connections: 2 ft (51 cm) multiconductor cable. Enclosure Rating: 17-4 PH Stainless Steel. Vibration: 20 g 50-2000 Hz.